Guided selling is a process that seeks to keep the selling conversation on-topic. 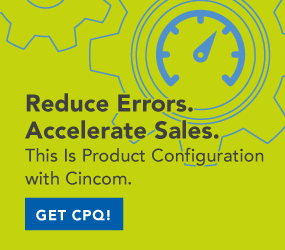 CPQ tools can help. In a large sense, selling is merely the delivery of decision information to buyers. The information should either draw the buyer closer to your product or push them away from your product—both outcomes are good. The buyer is either finding confirmation that your product fulfills their needs or learns that it does not. One outcome moves you closer to closing a deal while the other eliminates wasting time in pursuing a deal that is doomed to fail. For marketing professionals, the guided-selling process requires that lots of credible, relevant content be made available and accessible to potential buyers. The guided part means that potential buyers are guided toward relevant content by reviewing online behavior, interest in specific items and permissions granted by the prospect to the seller. For Sales, the process is more exact. For Sales, Guided selling is making sure that each prospect discussion is relevant and oriented toward answering specific questions. Knowledge about the prospect’s needs is exchanged for specific information about the seller’s solution. CPQ tools are essential to making this process work efficiently. Almost any sales discussion, regardless of where you are in the buying cycle, seeks to accomplish one thing: matching a need with a solution. The CPQ tools will guide the discussion through interview scripting built by product experts who are knowledgeable in the design of the product and its use. The needs discussion may involve physical properties of a given solution such as color, fabrication material or specific options. Consider buying a canoe. Are you using it to paddle about in a calm lake or pond? If so, perhaps a wooden or lightweight plastic canoe will fulfill your needs. But what if you are into whitewater canoeing and shooting rapids? For this type of application, the stronger and more substantial aluminum construction is perhaps more appropriate. Aluminum also tends to draw less water than other materials since it is a lighter weight than wood and plastic. So if you are shooting shallow-water rapids, aluminum has it all over the other materials. The sales rep may be able to remember to ask about what type of canoeing you have in mind, but chances are, the rep is also selling powerboats, fishing boats, swimming equipment and many other product lines. Knowing all of the right questions for all of those products is a stretch for most folks, so the CPQ tool remembers what questions to ask for each. At some point, the needs discussion around guided selling will involve pricing and optional prices available through different quality levels, payment plans or transaction types. Most folks want to pay a price that is reflective of value delivered, and sellers want to cover costs and derive a level of profit from their transactions. Prices vary based on quantities ordered and customer classification (national account status or GSA entitled). Other factors like season, region or country may affect prices as well. The pricing engine within CPQ tools takes all of those factors into account. Again, the interview-based scripting assures that the rep collects all of the relevant data about the customers to ensure that the correct pricelist is used in calculating the price for a specific deal. Other factors are also examined. Transactional alternatives such as leases, rentals or installment purchases are reviewed. Credit-worthiness determination can be subtly worked into these processes to evaluate the appropriateness of all possible buying scenarios. There is more to a deal than product and price. Customers have needs outside of the basic deal that are essential to making them happy and satisfied at the conclusion of business. Unfortunately, these types of requirements are frequently the source of dissatisfaction. Shipping and Receiving operations frequently have requirements about when shipments can be received, what carriers are acceptable and even how delivered products must be marked and packaged. This is especially true of shipments across national borders. It may be that orders involving multiple copies of the same product need to be received at multiple locations around the world. Companies ordering tablets or laptops may not want to receive and re-ship these items; they may prefer to have shipments to each using locations based on a specific schedule. These types of special arrangements may seem trivial and troublesome to the seller, but they are usually very important to the buyer. A CPQ tool will help you make sure these are not forgotten in the haste to close a deal. Addressing these and making sure they are included in your fulfillment plan will elevate you in the buyer’s eyes to a real partner who’s intent upon making the customer happy. Sales has to extend the guided-selling process that started in early cycle marketing communications into the completion of the deal. Effective listening and effective communication makes for a complete product solution delivered to the satisfaction of the customer.